Commissions - joannahedleys jimdo page! 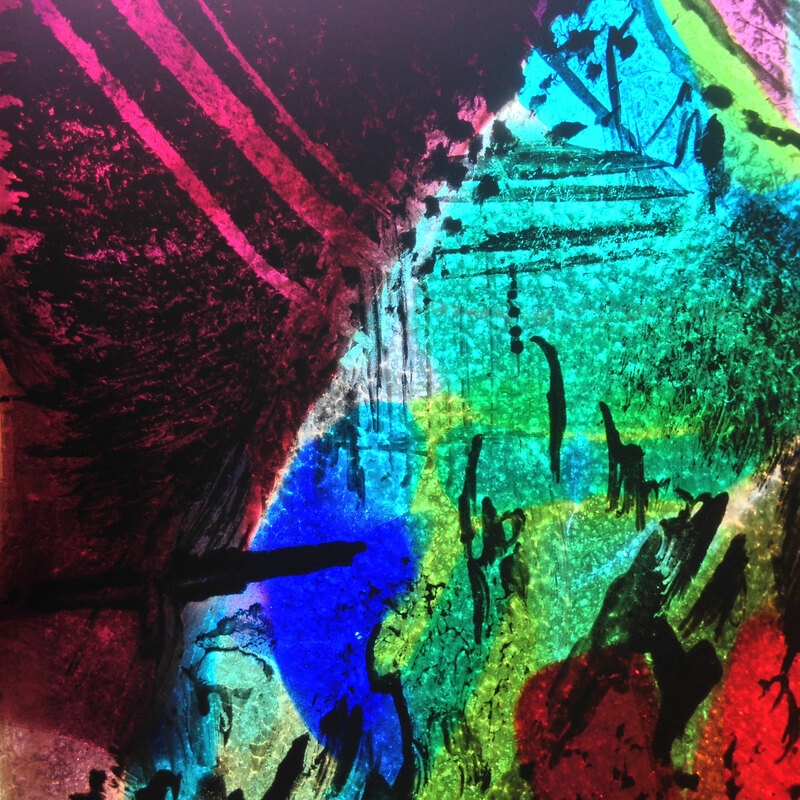 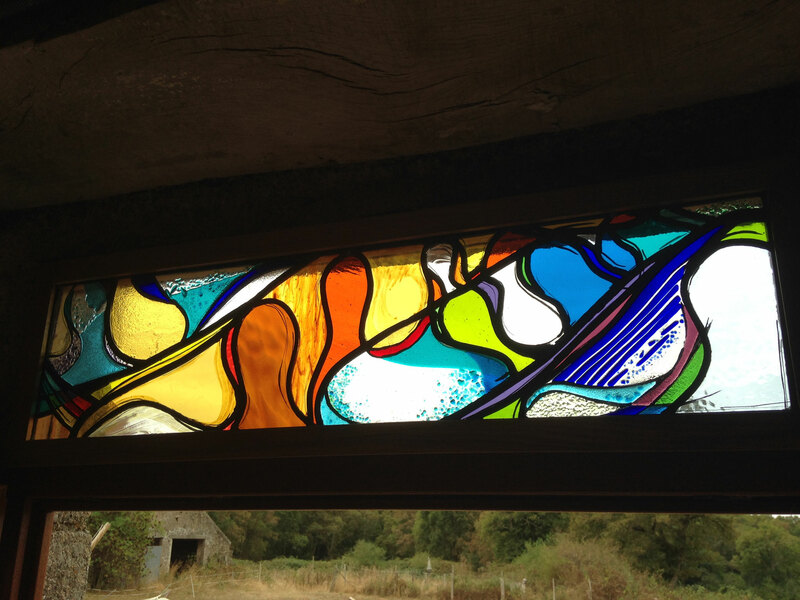 The Clunes was made in 1995 as part of my degree show, I still love the colours and the way this looks, photos taken from the inside so I flipped it so it the writing was the right way round! 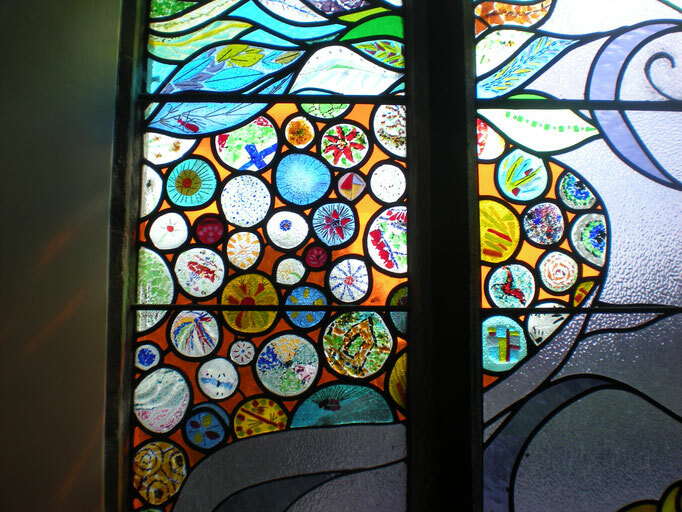 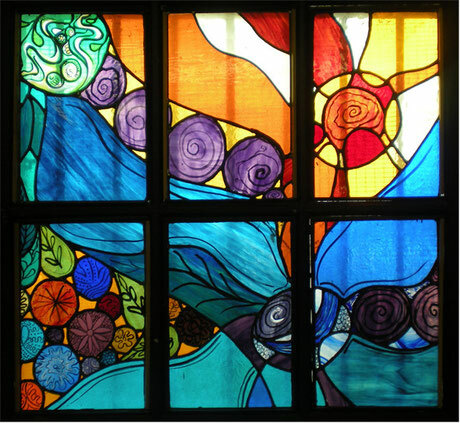 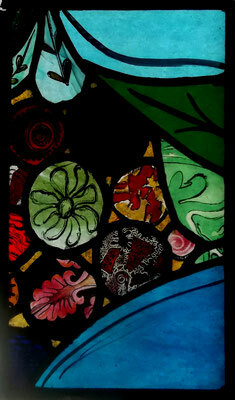 This is a window I made for the millennium, it sits in the riverside health centre in Newcastle upon Tyne. I used the symbolism of plants and flowers, to create this abstract design, the colours were chosen to promote communication, and the circles were a representation of the people that used the centre, everyone was welcome no matter their colour shape or size. 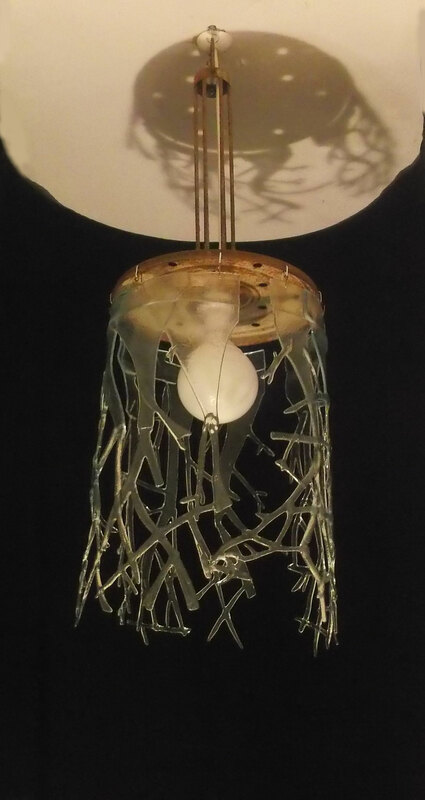 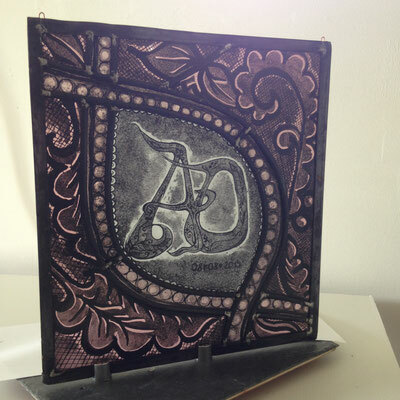 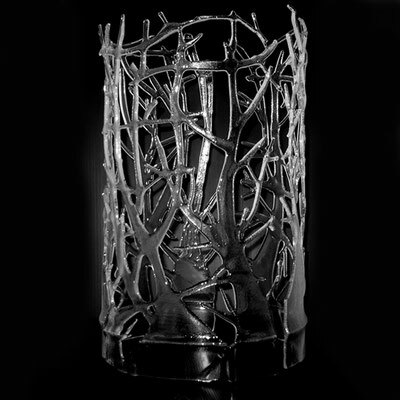 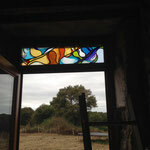 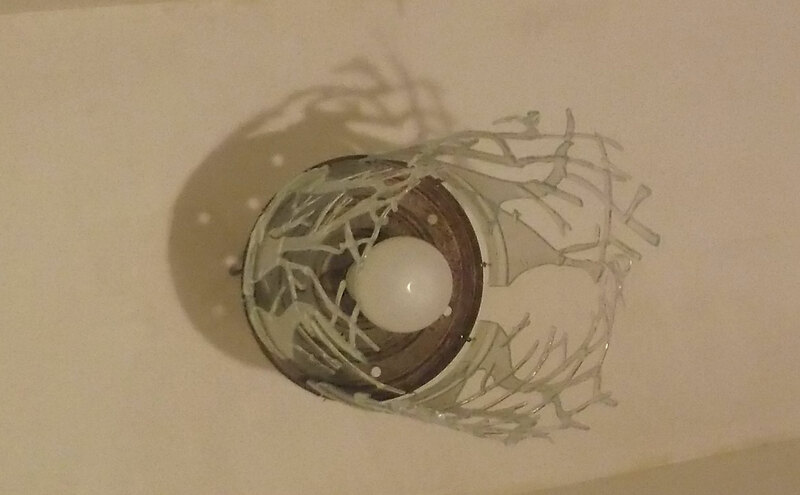 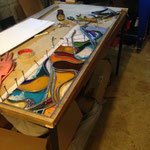 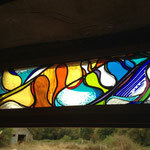 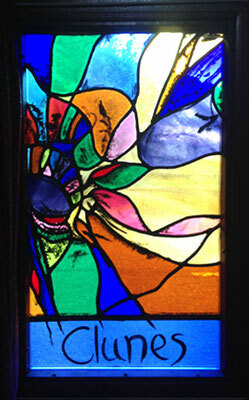 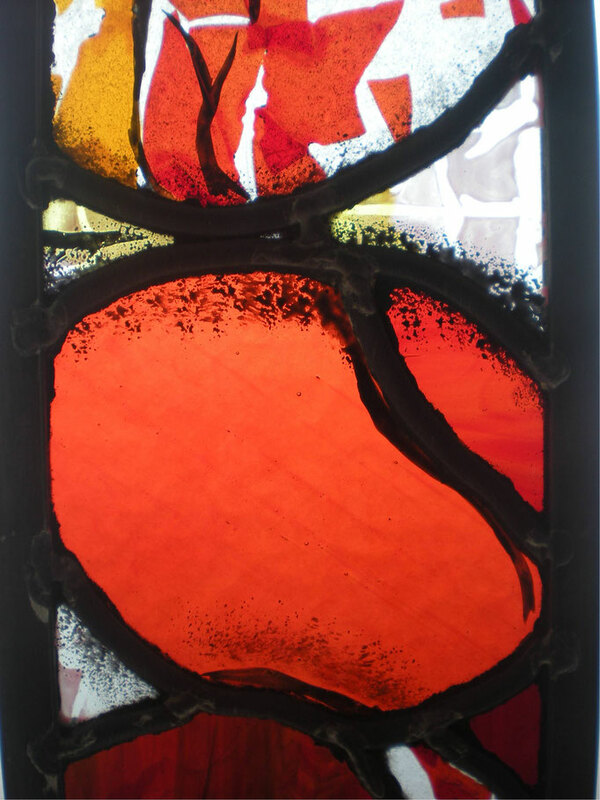 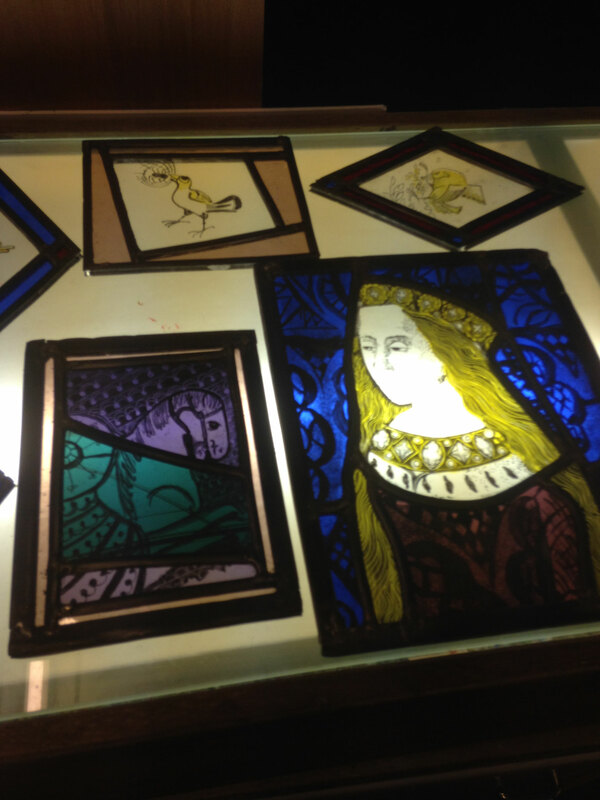 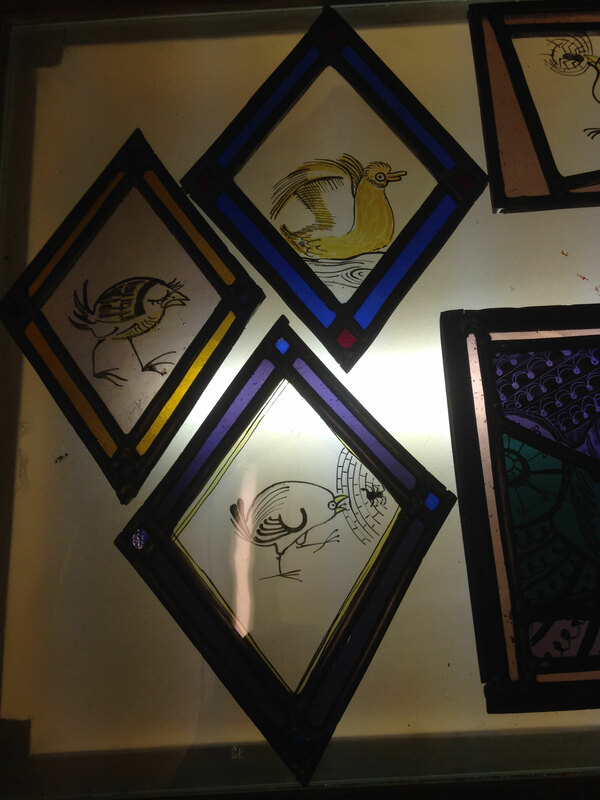 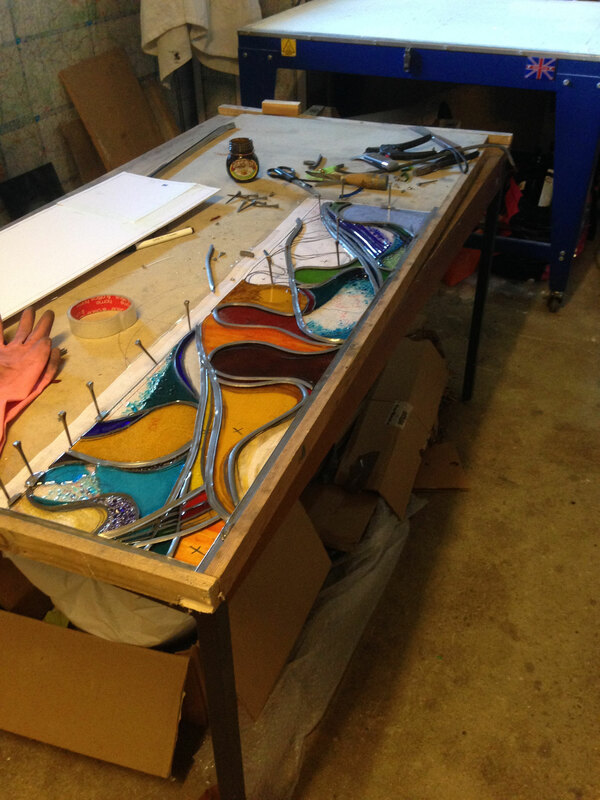 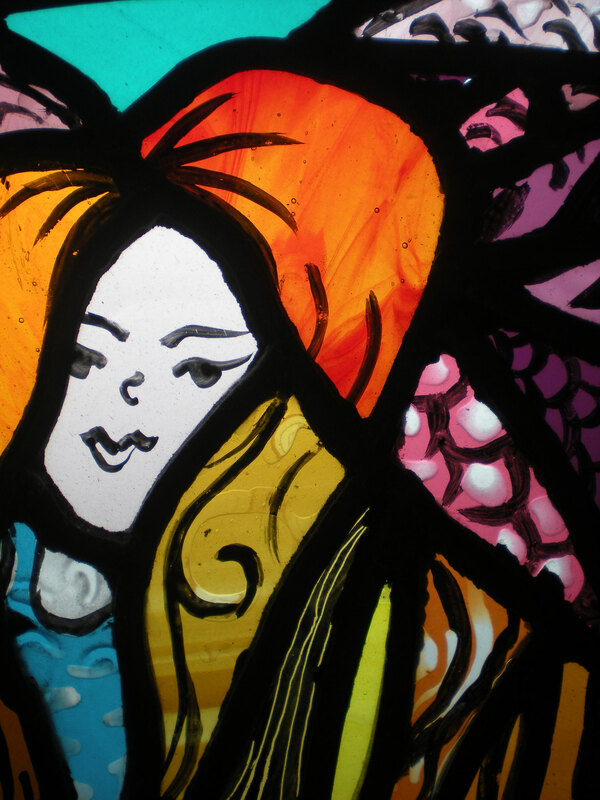 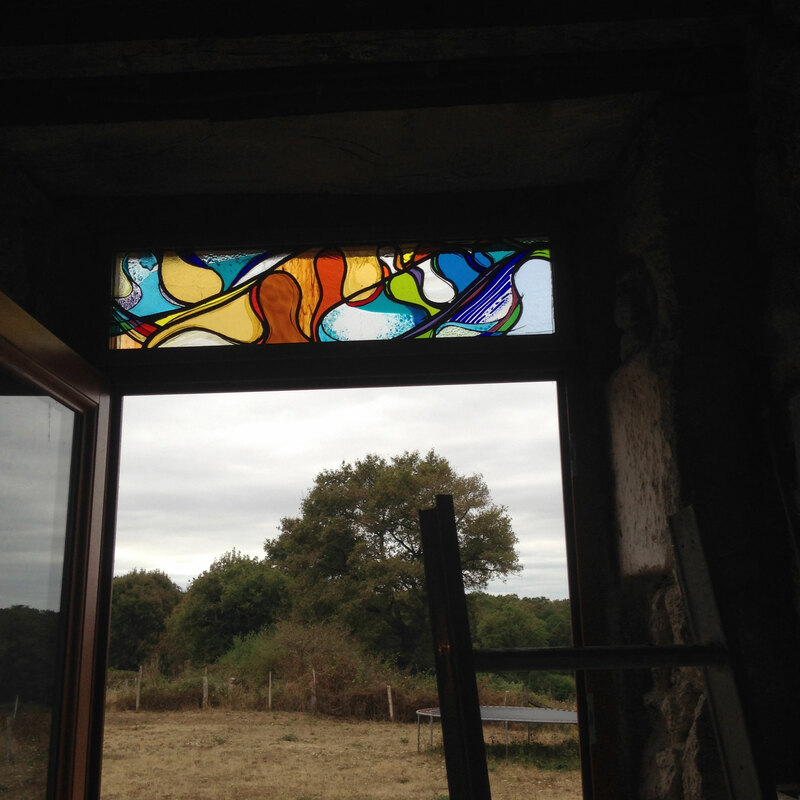 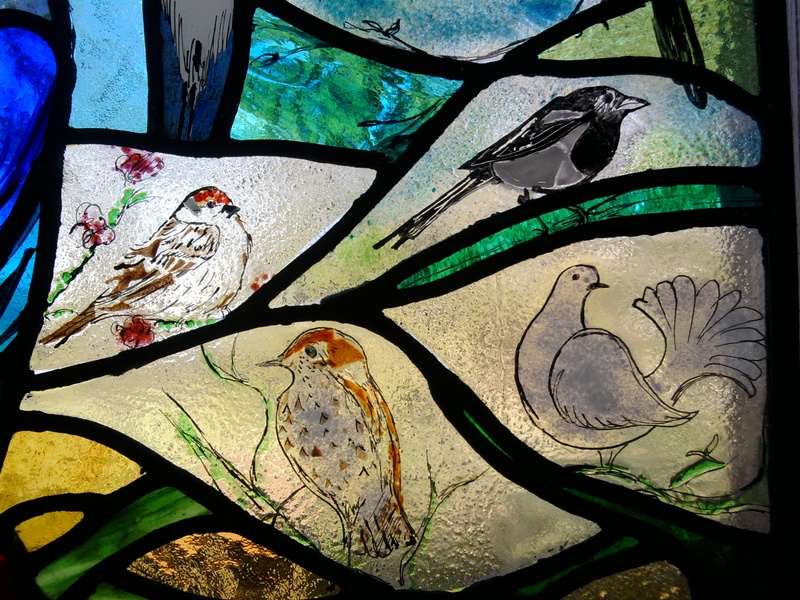 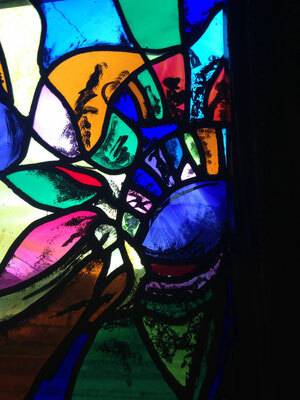 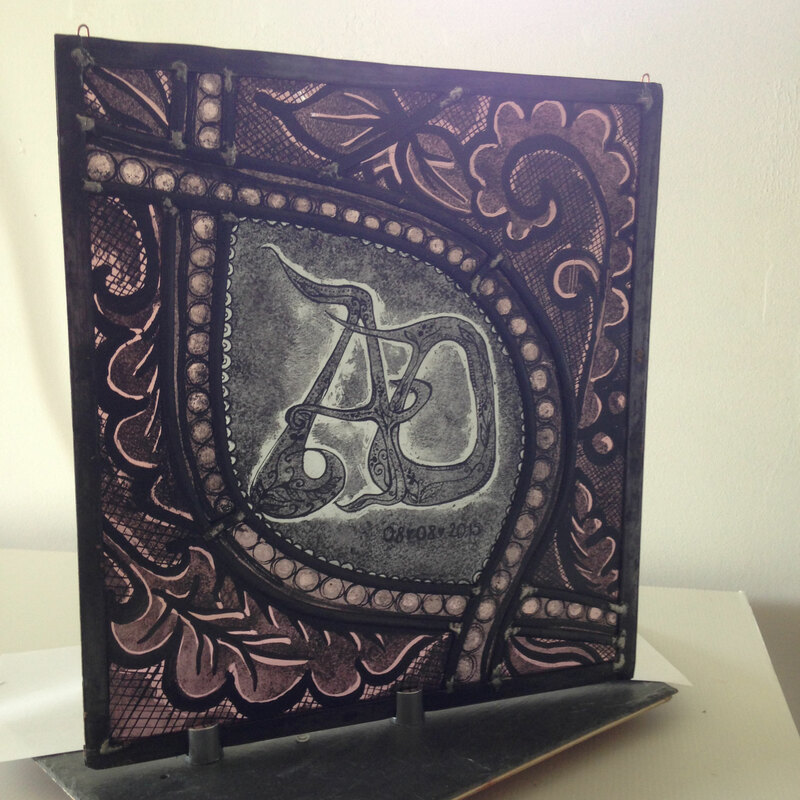 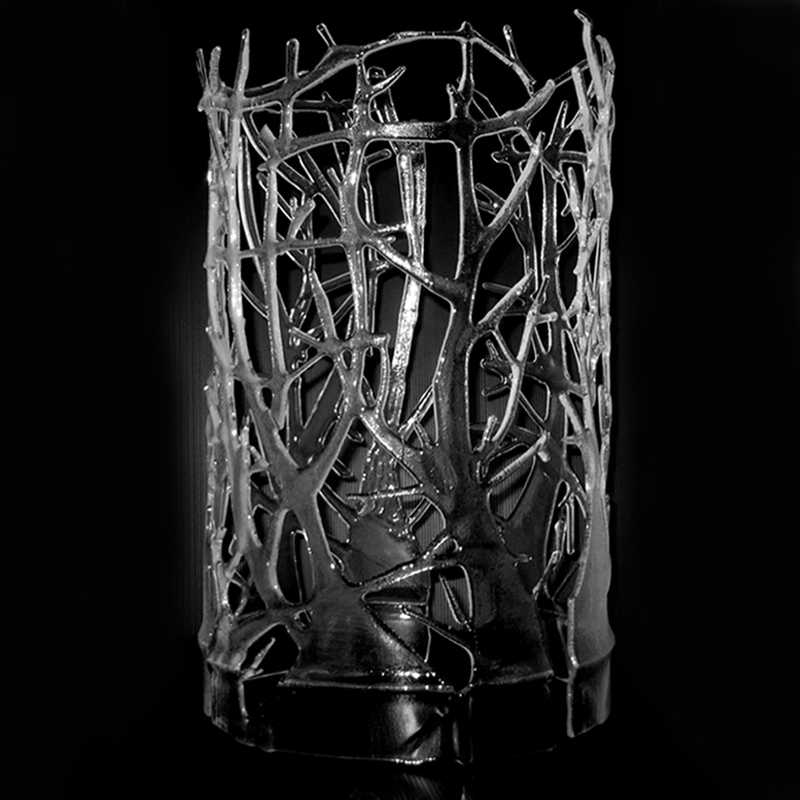 It is made using traditional stained glass techniques, coloured glass painted stained, sandblasted, then leaded. 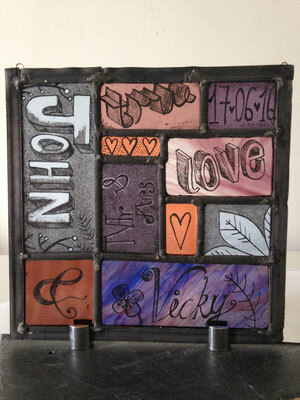 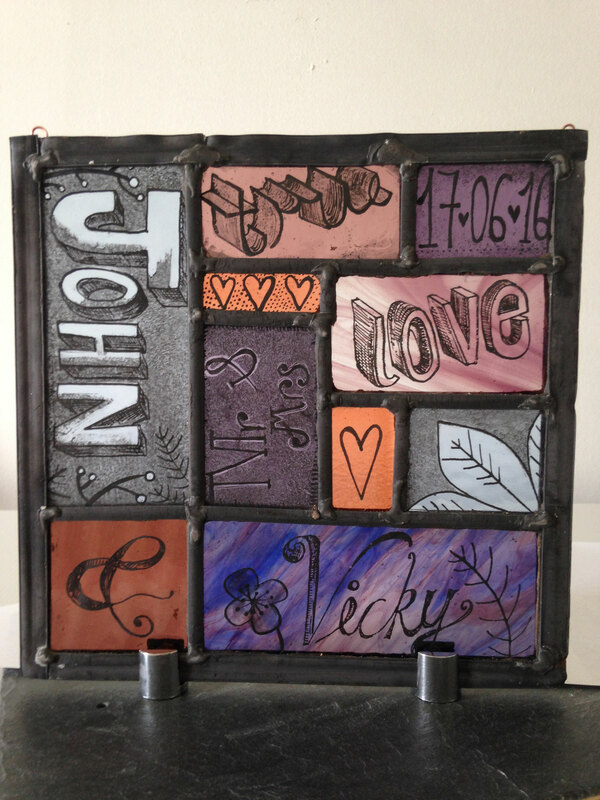 Unique wedding presents based on the colours of your wedding. 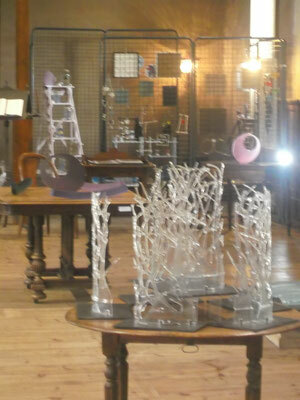 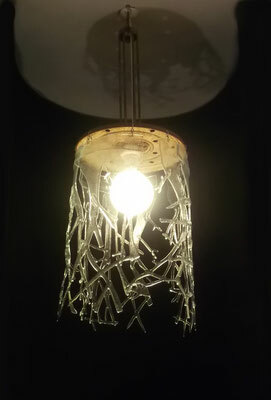 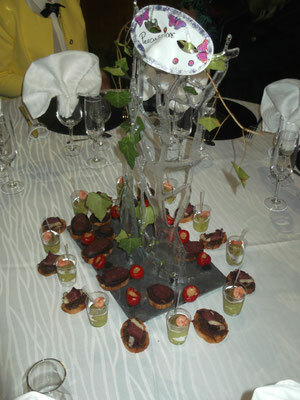 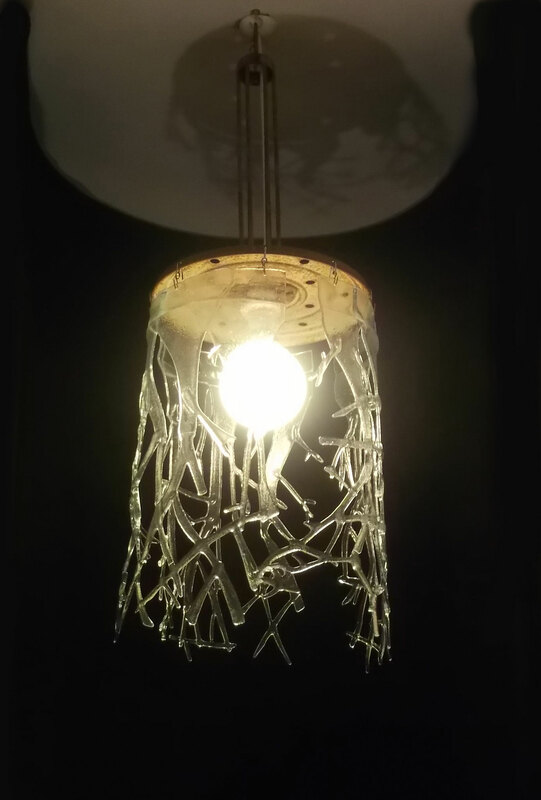 fused glass branches made up the table decorations for this wedding, I also made some into a chandelier and a sculpture for an exhibition. 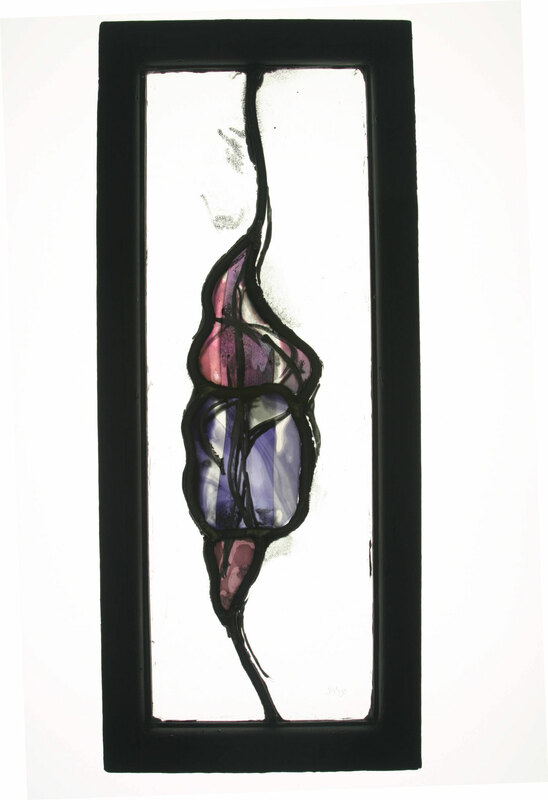 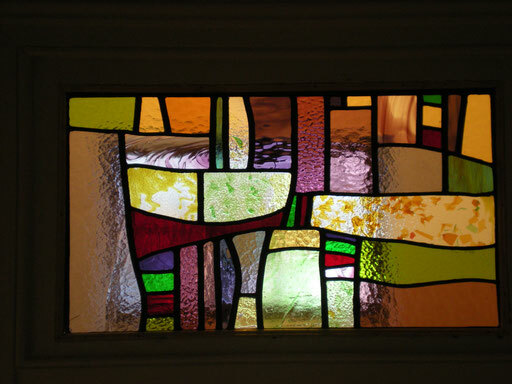 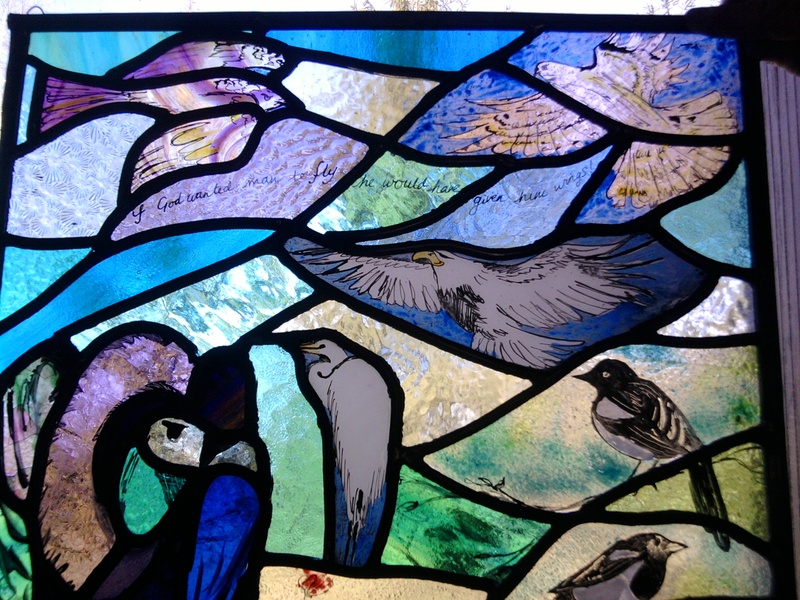 2008 This is a vestibule window, in Cullercoats Tyne and wear, leaded with fused elements, the lady who who commissioned it was full of great ideas, which made the collaboration a great deal of fun. 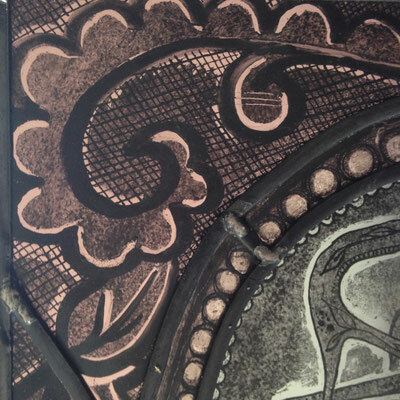 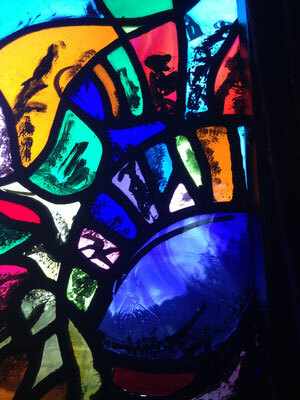 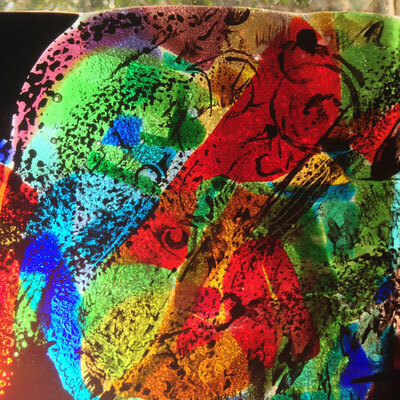 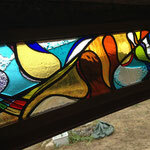 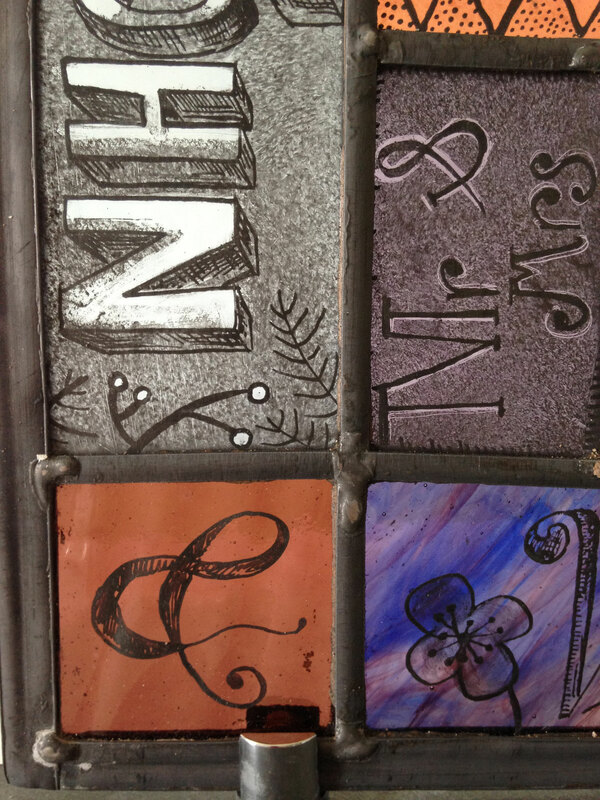 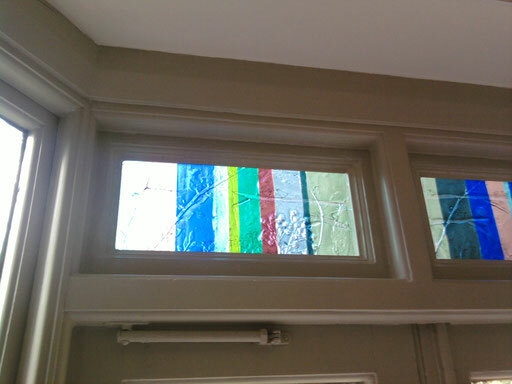 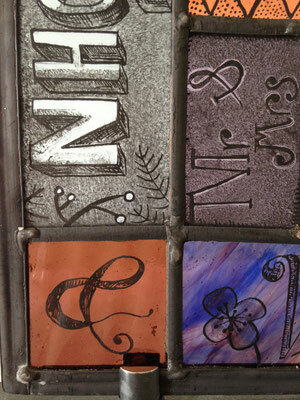 Detail of the window, it shows peices made with confetti glass frits, and bullseye glass. 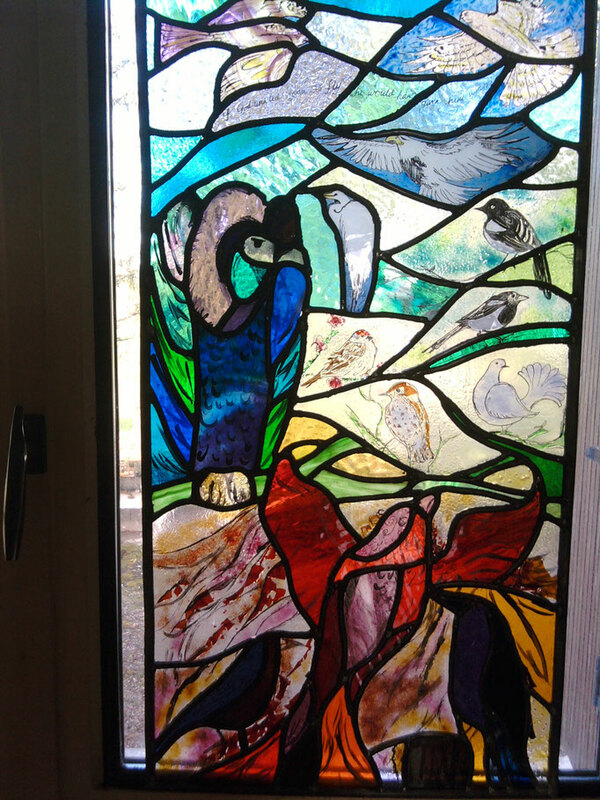 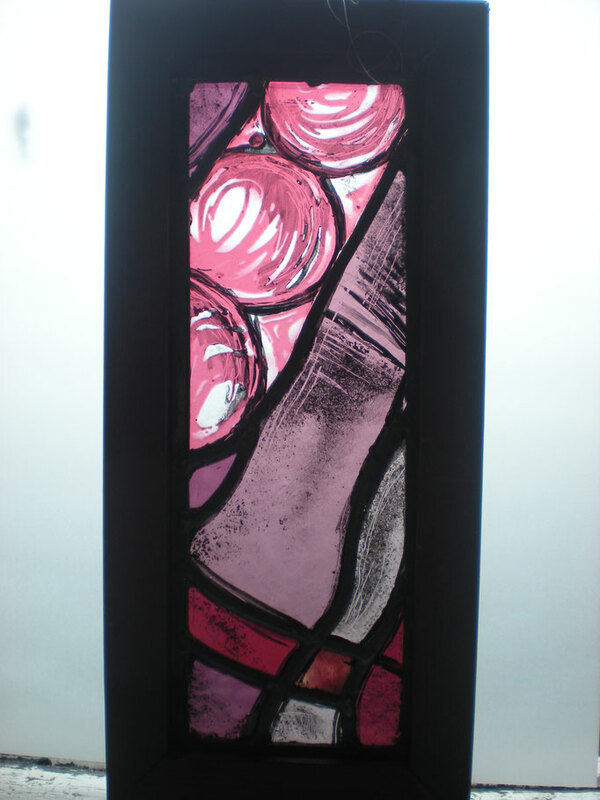 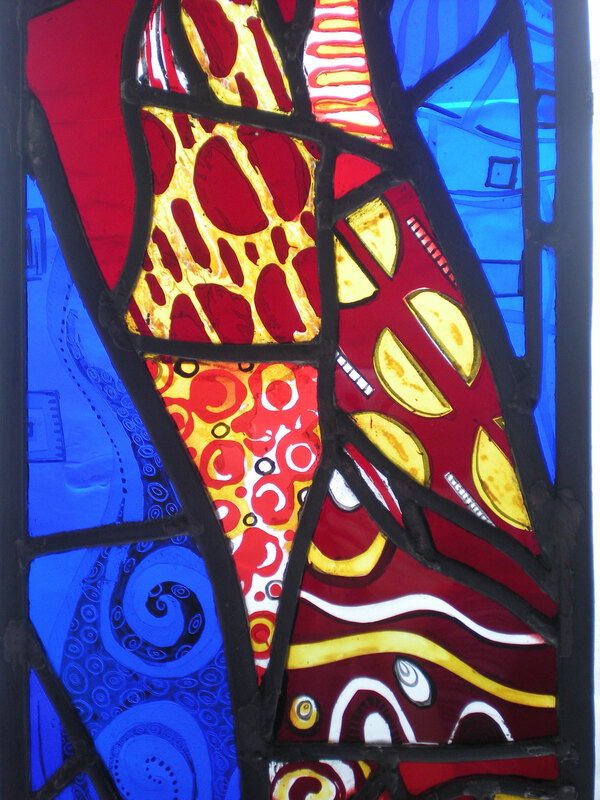 2009 This Panel was commisioned by a lovely lady who's favorite stained glass door was broken, she liked klimt and wanted me to make a window with the broken pieces of glass, if you have some glass you'd like recycled let me know and I can make something lovely with it for you. 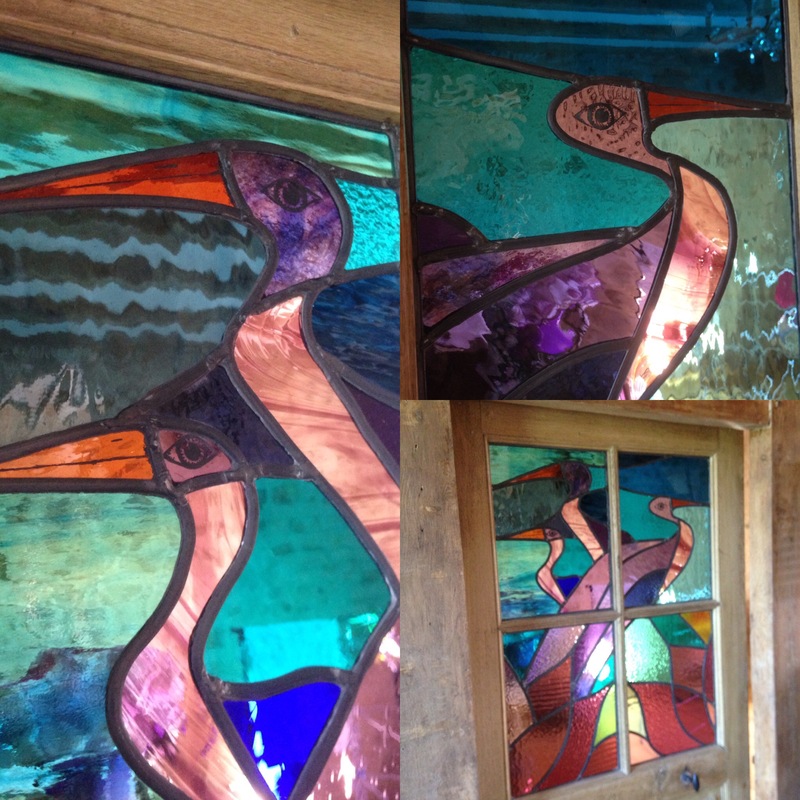 Here a selection of my work. 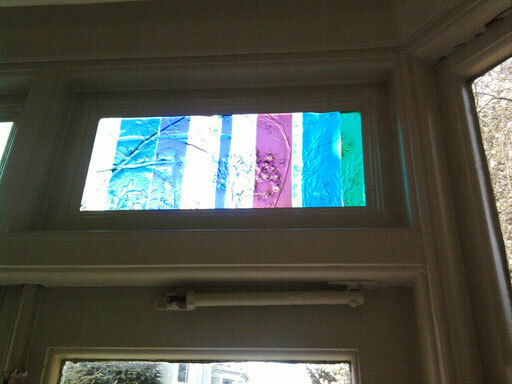 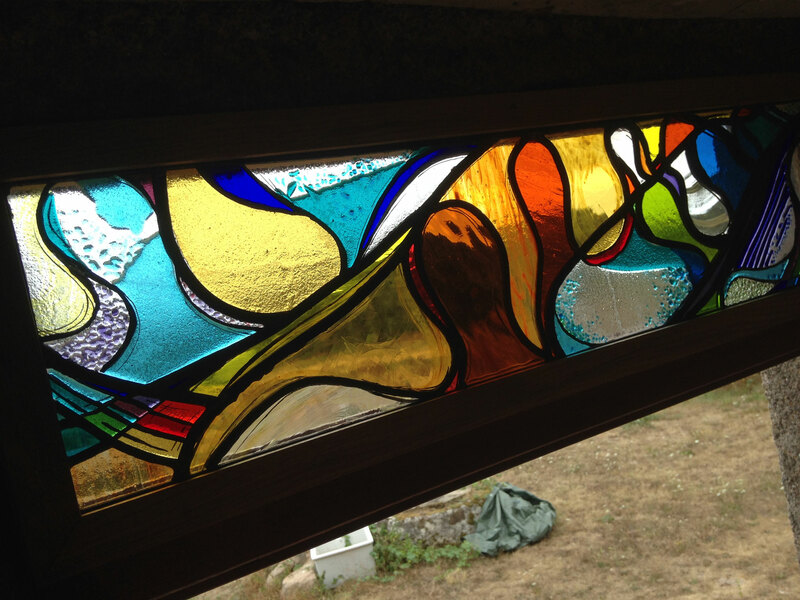 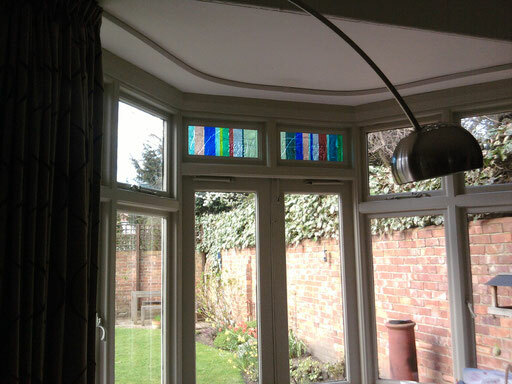 This window was made a back door, the brief was to use cool colours and simple shapes. 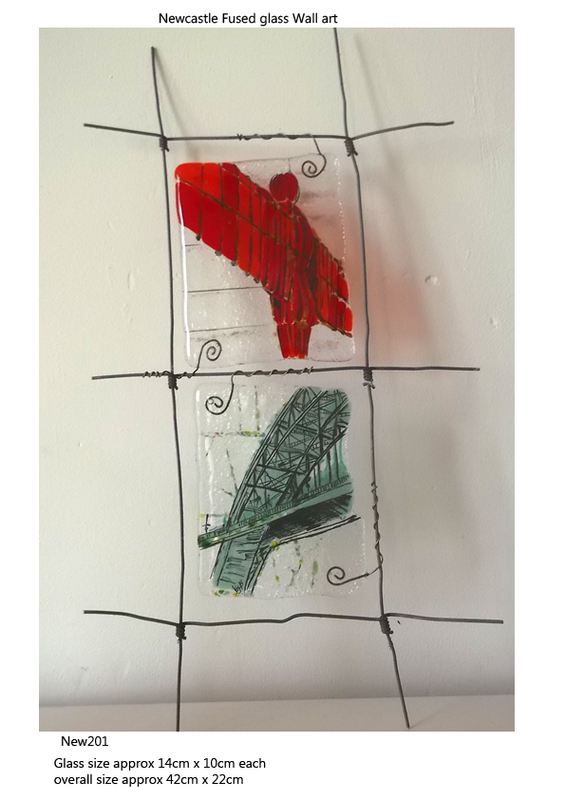 These are fused glass panels, I made a mould from plants from the garden and fused the glass on top to pick up detail, I added painted details also. 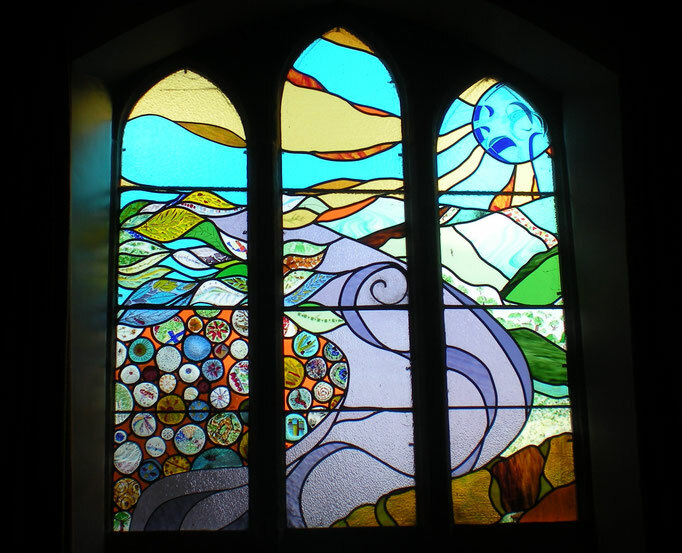 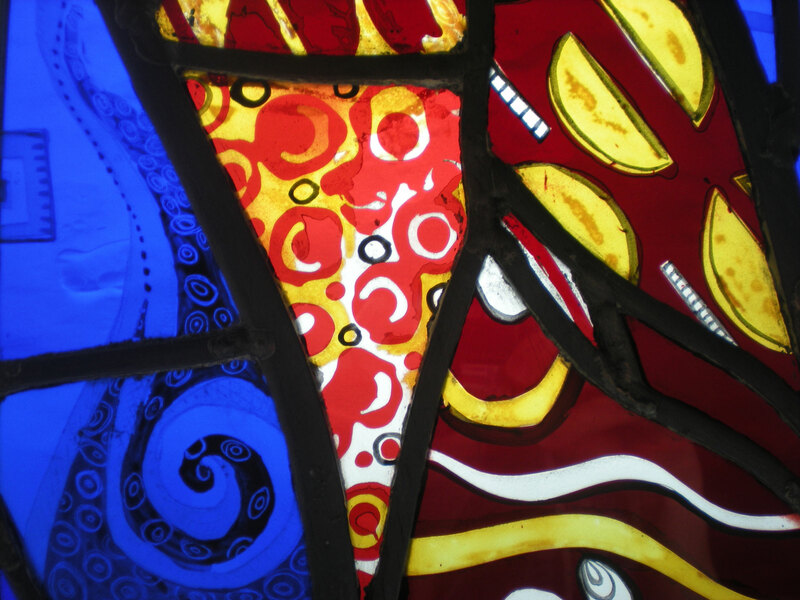 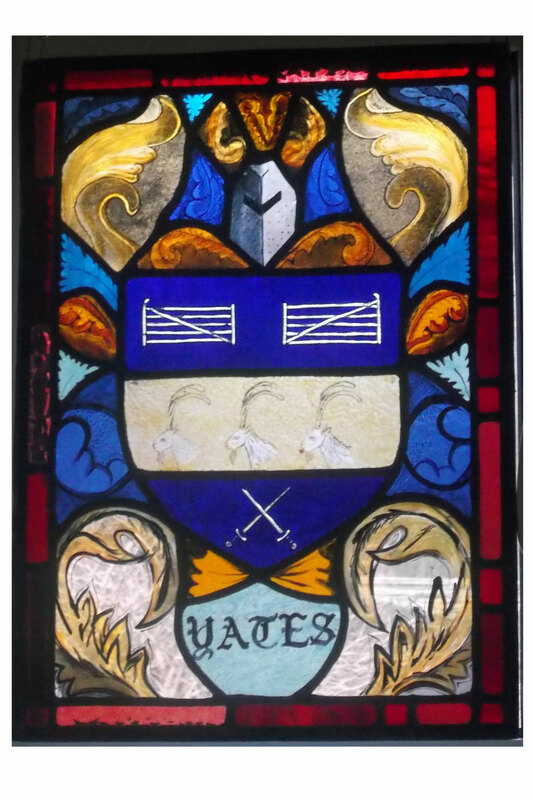 2003 these two panels are in Thorpe hall near Barnard Castle, commisioned for the cloak room, they are traditional stained glass, painted stained, with inclusions of fused glass elements.